Addressing depression, shown to be prevalent among elderly patients, can improve patients' management of their own chronic illnesses. Depression in the elderly often goes unnoticed because it is regarded as a natural part of aging. Without proper treatment and management, depression can lead to deterioration in overall health. In response to patient feedback, requests from facility staff, and health educators' observations, the authors implemented a depression support group at two geriatric health centers. The support groups consisted of 90-minute sessions, meeting once per week for six consecutive weeks, and were conducted by two health educators, both of whom had prior training in mental health. Topics discussed over the course of the sessions included the definition of depression and how it affects chronic diseases, stress management, elder abuse, fostering healthy relationships, and medication adherence. A pre- and post-Patient Health Questionnaire-9 (PHQ-9) or Geriatric Depression Scale (GDS) questionnaire was administered to determine the effectiveness of the support group intervention. Support group size was limited to 15 participants to create an intimate setting in which participants could feel comfortable. Once the support group concluded, the authors compared pre- and postquestionnaire scores and noted there was an improvement in participants' overall health. Participants described feeling happier, having more energy, and understanding the importance of taking their medications, and they displayed a greater desire to manage their chronic conditions following their improved state of mind. A phone call follow-up 12 weeks after the conclusion of the support group revealed that patients continued to use many of the recommendations and tools they had learned during the program. Often undetected or given inadequate attention because of its association with aging, depression affects 6 million of the more than 40 million Americans over the age of 65.1 Without proper treatment and management, it can lead to a deterioration in overall health. Many older adults, although unwilling to admit to feeling sad, will complain about aches and pains, a sign of depression and its effect on chronic disease. However, older adults may have medical conditions such as heart disease, stroke, or cancer that may cause or aggravate depressive symptoms. The intervention focused on improving depression in the elderly and motivating them to become more proactive in their own health care. Participants were taught how to differentiate between depression symptoms and chronic condition symptoms and to use their newly acquired skills toward improving their overall health. They also learned and practiced techniques for coping with stress. The settings were two geriatric health care centers that serve a predominately low-income Latino population in East Los Angeles. The centers function as a one-stop shop where participants can access medical and social services on site, including occupational therapy, physical therapy, pharmacy, case management, field trips, and socializing activities, all with the intent of preventing or delaying participants' transition into skilled nursing facilities. 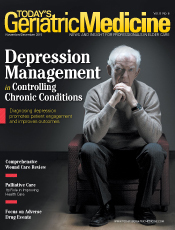 Those particular centers had experienced a high prevalence of depression diagnoses and as a result, experienced poor management of chronic health conditions among the older participants. The health education team was asked to research the issue and implement a depression support group with the assistance of medical providers and other center staff. Two health educators, both with prior training in mental health, delivered the intervention. 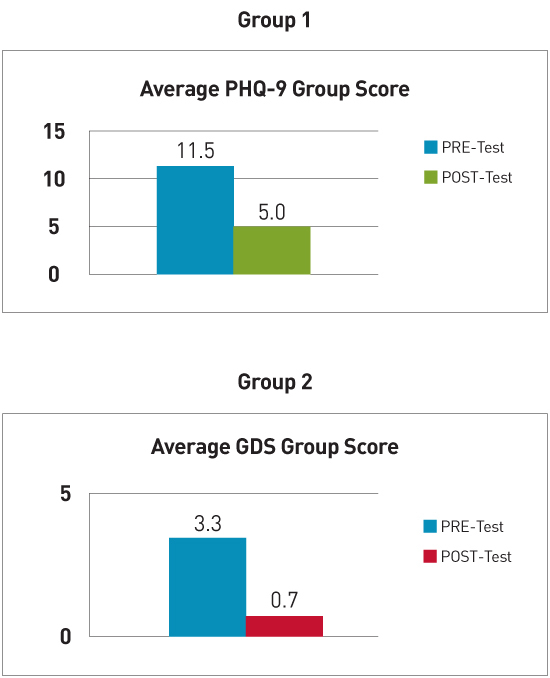 The first group of patients completed a pre- and post-PHQ-9. The second patient group completed a pre- and post-GDS questionnaire. To ensure that patients were able to read the GDS, the questionnaires were provided in a large font size to facilitate reading. Both questionnaires were intended to track patient improvement in terms of depression severity. Only patients who attended at least four of the six sessions were considered to have completed the program. With regard to attendance, the number of attendees was retained with the implementation of an incentive program. As part of the incentive program, each participant who completed the program received a stress ball, exercise towel, resistance band, arts and crafts activity kit, mentally stimulating activity workbook, relaxation CD, scented candle, and list of Los Angeles County mental health resources. The 14 participants in the depression support group pilot included two men and 12 women. The entire group of participants had histories of mild to moderate depression as evidenced by previous PHQ-9 scores recorded in their medical records. The information below contrasts the follow-up evaluations of the two groups, based on the depression questionnaire participants had completed. • one worsened, possibly resulting from the patient completing the pretest on his own and misinterpreting some of the questions. Overall, the PHQ-9 was found to be a difficult tool to administer with a frail geriatric population. Patients appeared to struggle to fully understand the questions. • no issues were discovered in administering the GDS questionnaire. Patients appeared to better comprehend the questions asked in the GDS. • identifying patients recommended by center staff and referred by the medical provider. This pilot underscores the need for depression intervention programs and support groups for the elderly. Additionally, it supports the concept of group therapy as an effective tool in helping older adults manage their depression. Results support the use of the GDS in lieu of PHQ-9 when evaluating programs that target medically ill and mild to moderately cognitively impaired older adults. It is important to evaluate participants before deciding which evaluation tool to use. The PHQ-9 scale is recommended for use in adults with no cognitive impairments who are able to distinguish chronic disease-related pain and depression, whereas the GDS is best used in long term care facilities among patients who may have cognitive impairments and may be unable to distinguish chronic disease-related pain from symptoms of depression. The questions in the PHQ-9 could be answered mistakenly, resulting from the effects of medication rather than the state of mind or depression per se. The questions asked in the GDS relate more to feelings and emotions that will not be mistaken with possible effects of medications. One of the topics discussed during the support group that exerted the most significant impact was medication adherence. Through this session, participants learned the importance of taking their medications as had been recommended by their medical providers. As a result, participants began to notice the effects the medications had in terms of sleeping and eating habits. This discussion was a breakthrough in which participants were able to articulate the effects of their medications and attribute their lack of sleep or appetite to secondary medication effects rather than depression. Facilitating this dialogue enabled patients to speak more openly to their medical providers, particularly in light of the reticence older adults have in accepting and discussing depression. Building a strong relationship between health care professionals and participants and fostering trust among them were key components in developing and conducting a successful support group. Patients became comfortable with discussing difficult topics and sharing with the group. Some of the difficult topics discussed included elder abuse, neglect, and family relationships. Prior to participating in this support group, many of the participants had not been given the opportunity to speak on these topics. Providing participants with the time to voice their feelings helped them to feel a sense of care and worth. Participants learned to accept themselves, take control over their health, and pursue a healthier lifestyle. A helpful suggestion would be to conduct a relaxation technique at each one of the six sessions. It is a good way to ease participants into the new session, as many can be anxious before the session begins. Icebreakers are also good ways to foster good relationships among the participants. Many of them may not have had prior interactions with each other. If relationships among participants are not established, participants may be reluctant to express and share feelings or emotions. Ground rules were established to ensure participants felt comfortable within the support group and safe in sharing with other group members. Such rules included confidentiality, respect, allowing participants to speak one at a time, and no criticizing. Furthermore, the program could be enhanced through extension to a minimum of eight weeks rather than six weeks. This extension would allow the support group to cover the same information more extensively and provide more time for discussion. It would also offer patients an additional two weeks to implement and practice stress coping techniques as instructed. It is important to foster a healthy relationship with participants and reassure them they are not alone. One of the key components in depression management is ensuring that participants maintain a sense of self-worth and control over their well-being. Health educators can provide participants with the time needed for them to express themselves, in contrast with limited visits with medical providers who are often constrained to 15-minute patient visits. This health care reality makes it critical to collaborate as a team and capitalize on existing resources. Lastly, counseling and group therapy are effective and low-cost depression management tools for older adults. Well-seasoned lay health educators can offer an affordable approach to facilitating group sessions over the long term. Any facility that caters to a geriatric population should consider offering similar programs to assist older adults who are facing mild to moderate levels of depression. With the support of an interdisciplinary team, including physicians, nurses, social workers, and health educators working together, depression can be better identified at an early stage. It's important to promote a clear understanding that depression is not a normal part of aging, but that it is a medical problem. Detecting depression in its earlier stages can increase the effectiveness of support groups and ensure patient well-being, both physically and mentally. — Maria Guadalupe Lara, MD, MPH, and Reina Arias, BA, are seasoned health educators at AltaMed Health Services, the largest network of federally qualified health care centers in the United States. Both work specifically with geriatric populations, providing health education classes and individual counseling on topics relevant to chronic disease management and geriatric health, such as diabetes, hypertension, Alzheimer's disease, stroke, and fall prevention. They initiated depression support groups in 2012 and, since then, have been facilitating group sessions across AltaMed's geriatric health centers. 1. Depression. National Institute of Mental Health website. http://www.nimh.nih.gov/health/topics/depression. Accessed June 24, 2015. 1. Centers for Disease Control and Prevention, National Association of Chronic Disease Directors. The state of mental health and aging in America: Issue brief 1: what do the data tell us? http://www.cdc.gov/aging/pdf/mental_health.pdf. Published 2008. Accessed June 24, 2015.